But Heroes win the day. Shows the brave the way. And lead them to another place. Richard and Melek are unable to figure out where Orkan had disappeared to when, suddenly, they hear a familiar voice crying for help in muffled yells. They follow Orkan's calls to the roots of an old tree and find their friend...spreadeagled on the ground and covered by hundreds of dark red worms pinning him down. 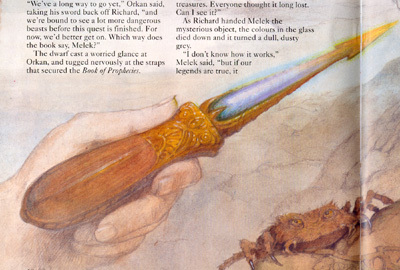 On Orkan's suggestion, Richard reaches for Orkan's sword, avoiding getting pinned down by the worms himself, and uses the blade to carefully slice the worms off the pigman's body. The worms retreat, and Orkan is freed. Deciding to get a move on in their quest, Orkan consults Melek for what the Book of Prophecies says. Melek removes the giant tome from his back...and Richard notices a strange glint in the book's spine. He quickly inspects the book's spine to see what it is, and ends up finding a "narrow length of metal which had a glass arrow set into it. The glass was colored, but Richard could not say precisely what color it was. First it seemed one, and then another, as if the whole spectrum was battling for supremacy." Melek recognizes it as the Path Finder, an old treasure once thought lost. Melek states that the instrument will guide them to their heart's desire on the path of life. Realizing that their lives depended on the pods, Richard moves the instrument around until he finds the direction the vibrant colors glows strongest. The direction happens to be right where some awful wailing was coming from. The trio follow the wailing all the way to a clear lake surrounded by dead grass in the midst of a vast clearing. As they close in on the lake, Richard notices several hairy beasts swirling around in the water, raising their heads in cries of help. 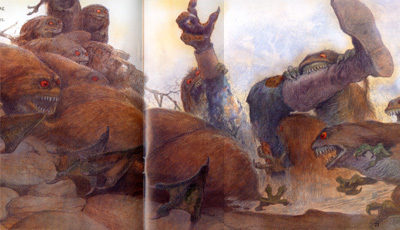 Richard quickly calls for Melek's rope to save the drowning creatures, but Orkan abruptly tells his friends to get down, saying something about Tolosh. Everyone does so, and Orkan points out someone else approaching the lake. The person approaching was a leopardman, and he seemed to be heading the call of the furry creatures. He extends his hand into the lake to help them...and his eyes grow wide with terror as he is suddenly pulled into the lake. Immediately thereafter, the bank of dead grass begins to move, and Richard realized that the dead grass was in fact a herd of tiny furry creatures. The Tolosh begin sliding like otters in the water, and the now screaming leopardman is pulled underwater. He resurfaced several times, but each time he is more and more unrecognizable as the Tolosh consume him from the outside in. Soon, the leopardman has been completely devoured, leaving nothing but his blood that begins drifting downstream. Most of the Tolosh climb out of the water and resume their positions as "dead grass", while a handful remain in the water to play the part of decoys once again. Richard, Melek, and Orkan are stunned. Orkan tells his companions about the Tolosh - how they're harmless on land but deadly in water - and Melek decides to read the next riddle in the Book of Prophecies. After reading the riddle, they begin deciphering it as best they can - the golden arrow is obviously the Path Finder - when they notice someone else approaching the lake. They quickly rush towards the man to warn him of the Tolosh, who already begin crying out their pleas for help. As they approach the stranger, Richard hears Golan's voice in his head telling him to trust the stranger, whom they find out is another leopardman. Richard then notices the leopardman's eyes; they're purple, just like in the riddle. They warn the leopardman of the Tolosh, who are still screaming out for help, and tell of how another leopardman was eaten by them. The leopardman realizes the creatures had devoured his friend Rabat, and introduces himself as Merkat...before placing his knife against Richard's windpipe. Melek tries telling Merkat that Richard is the Chosen One, but Merkat is still suspicious of them. Orkan draws his sword and threatens Merkat, but the leopardman refuses to back off. Then Orkan tells Merkat that they saved his life, to which Merkat sneers that perhaps he owes them one. Merkat proclaims, as a man of honor, he'll do all he can to help them. Richard mentions the pods...and then realizes that perhaps "pluck from death the shining Grail" could refer to the Tolosh. The Tolosh decoys manage to overhear Richard's conversation and cry out that there is, indeed, a pod located at the bottom of the lake inside a casket; all Richard has to do is dive in and get it. Merkat responds by launching his spear at the decoys and missing. Richard stops Merkat just in time before he enters the water, and then mentions that he has a better idea. He speaks to Orkan and Melek for a momebt before turning to the Tolosh decoys, telling them that he'll dive into the lake...but only if they allow him to see it first. One of the decoys nods and disappears under the water, changing from a decoy into a true water Tolosh. The decoy swims down to a half-sunken casket, opens it, and pulls out a small purple object. She then swims to the surface and holds it up for Richard to see. Richards commands her to bring it closer; the Tolosh does so. At that moment, Orkan takes Melek's rope and whips it through the air, wrapping its end around the Tolosh's wrist and giving it a firm yank, causing the pod to fly through the air. Richard grabs it and stores it into his bag, smiling to himself at their success at finding the first Life Force Pod. The Tolosh, useless on land, merely shriek in anger before falling silent. Using the Path Finder, the group begins moving again, this time with Merkat. Melek mentions that a riddle in the Book of Prophecies explains how the ancient device works and that they'll have to find it nex time they stop. As they move from the clearing towards a nearby forest, they tell Merkat of his story, to which Merkat replies that the real test was about to begin. The group then enters the woods, which grow gloomy really quickly. As they move deeper and deeper into the forest, Merkat has the feeling that the paths were somehow changed, as if luring them into a trap. Just then, they begin hearing a thundering, crunching sound, like somthing large moving through the undergrowth in rhythm. 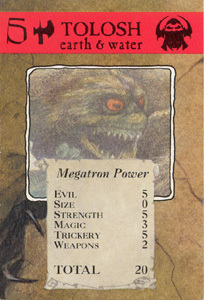 Merkat says that they could be Cozards, the Evil One's stormtroopers, and orders everyone to hide in a nearby thicket. Everyone lies still as the thundering sound grows closer and closer until it's almost on top of them...and then abruptly stops. Richard prays silently that whatever was heading their way was now gone...when the whole thicket in front of them is abruptly ripped completely open. 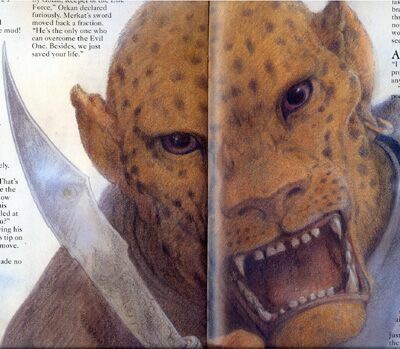 Merkat of the commom beasts is a leopardman who probably was a survivor of the final battle. He probably wandered around looking for survivors with his fellow soldier Rabat when Rabat, who went on ahead, was killed by the Tolosh. 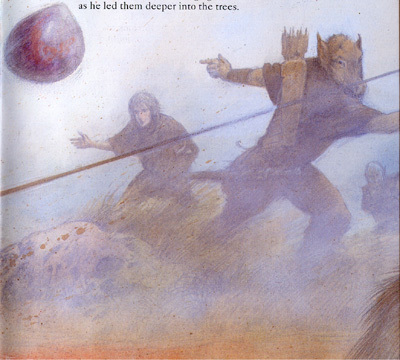 He, too, was almost eaten by the Tolosh when he was saved by Richard and his friends. While hardly the friendly type, Merkat is an honorable man and will do all that he can to help the Chosen One in return for saving his life. The Tolosh are fearsome little creatures that reside in packs in Lake Garoon. While the majority of the pack lie dormant on the lake's edge, using their fur to camoflage themselves as dead grass, several decoys swirl the waters and cry out in terrified voices for help. Anyone who answers these calls by stepping into the water will be pulled under, and the rest of the heard will slide into the water to devour their victim. Tolosh are deadly in the water, but they are pretty harmless on land. They were also the protectors of one of the stolen Life Force Pods until Richard cunningly managed to take it from them. "...They moved with sinuous ease, turning and wriggling, eel-like in the underwater currents. They were [now] true water Tolosh. Their faces showed the same, rapacious teeth as the land Tolosh, but their skin was more hideous. A lifetime spend in the water had rotted their features to a pulpy grey mass. Eyes bulged like gluey balls. Lips had become scaly strips of flesh. Noses were little more than collapsing blobs of gristle. On some, the chins had fallen away to leave nothing but bare bone." 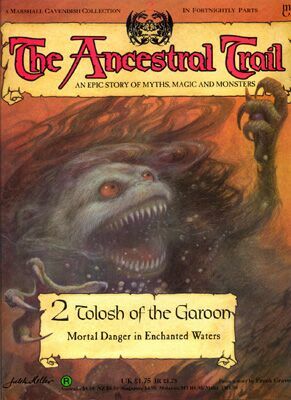 The second volume of The Ancestral Trail introduces Richard to his second "multiple enemy", meaning enemies that come in groups, unlike the moss beast Sumar. First came the Grapfrits, and now the Tolosh. But the Tolosh differ from the Grapfrits in that they possess intelligence. They can talk, they can strategize, and they can coordinate. Of course, they aren't geniuses either, as they allowed Richard to trick them into taking the Life Force Pod away from them. One thing I would like to mention about this volume is that it shows just how gruesome it can get. 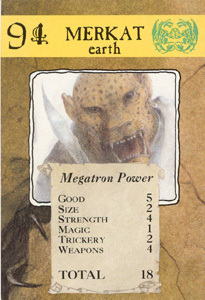 When the Tolosh attack and devour Merkat's friend Rabat, they really go to work on him. 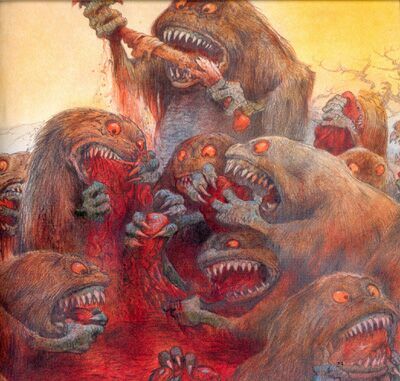 One of the pictures above shows just how bloody this series is willing to go, which certainly separates The Ancestral Trail from ordinary children's literature...or at least from children's literature typically found in the States. It's this kind of grotesqueness that makes me sigh at how santized American children's entertainment is sometimes. Melek: "Let him go! He's the Chosen One!" Merkat: "That's easy to say. I'll kill this fool and slice the rest of you to ribbons before you know what's happening." "There's something I don't like here. The forest feels different - the paths seem to have changed. Everything's quieter. The trees look greyer. I can't help feeling were being lured into a trap."